Welcome to Real-life Sci-fi worlds. We are using science to explore life-bearing worlds that are the settings for science fiction stories. Up today: the oscillating Earth. Earth’s orbit is not fixed. Gravitational kicks from the other planets change the shape of Earth’s orbit. Earth’s orbit oscillates between being perfectly circular (having an “eccentricity” of zero) and being 6% from circular (having an eccentricity of 6%). The tilt of Earth’s spin axis (its “obliquity”) bounces between about 22 and 24.5 degrees. The timescale for this to happen is about 20,000 years. These changes are pretty minor and slow. No big deal, right? Well, it turns out that they are a big deal! The very small changes in how Earth is illuminated by the Sun are responsible for the ice ages! The ice ages are driven by Milankovitch cycles, the oscillations in Earth’s orbit and spin. The three main variations in Earth’s orbit linked to Milankovitch cycles. The eccentricity is the shape of Earth’s orbit; it oscillates over 100,000 years (or 100 k.y.). The obliquity is the tilt of Earth’s spin axis, and the precession is the alignment of the spin axis. Credit: Scott Rutherford. Earth had much more dramatic ice ages in its past. There were multiple times during its history (notably 650 million years ago, during the Neoproterozoic) when Earth is thought have been entirely covered in ice. These are called “snowball Earth” episodes. They lasted for millions of years. A snowball Earth is a deep hole for a planet to fall into. As a planet gets colder, parts of the planet start to freeze. Ice is white. Ice-covered rocks reflect more light than plain rocks. So the planet reflects more light (energy) than it used to. This makes it colder, and makes it freeze even more. Which makes it reflect more light. And so on. This is called the ice-albedo feedback. On a planet like Earth, the poles freeze over first. If ice creeps down too close to the equator, then the planet can completely freeze over. The global temperature can remain stable at ridiculously low values, with the equator at the same temperature as today’s Antarctica! The bad thing is: since the planet is so reflective it has a hard time absorbing heat and melting out of the snowball. The snowball Earth is disturbingly stable. It can last a long long time (millions of years). But there is another way. A Milankovitch-style solution. The more eccentric a planet’s orbit, the more total energy it receives from its star (for a given average orbital distance). As a planet’s orbital shape oscillates, so too does the energy it receives from its star. The planet is colder when its orbit is circular (or just closer to circular) and warmer when its orbit is more elliptical. So if a snowball planet’s orbit gets eccentric enough then it can heat up and melt! This animation shows a climate model of an oscillating Earth. When the planet’s orbit is near-circular — when its eccentricity e is low — it gets cold and freezes over into a snowball. But when the planet’s orbit gets eccentric, it heats up enough to melt through and escape the snowball phase. Of course, when the planet’s orbit gets more circular it just freezes over again… It’s a repeating snowball planet! Earth with an oscillating orbit. The colors represent the temperature across the planet: only green is above freezing. Blue and white are super cold and red is warmer but still freezing. The planet’s orbital shape oscillates following the bottom curve (eccentricity e=0 means the orbit is circular). Credit: Dave Spiegel (from this paper). More details here. The periodic “snowball” is just one possible consequence of an Earth-like planet with an oscillating orbit. In general terms a planet bounces between being an “eccentric Earth” and a more “normal” Earth. The “eccentric Earth” is a pretty cool sci-fi world. Stretching out Earth’s orbit into an ellipse (while keeping the same average orbital size) makes the climate much more extreme. Winters are much longer and colder. Summers are much shorter but intense. The latitude of the planet where the star is directly overhead at the hottest part of the summer is “branded” during the passage close to the star. This can can be good or bad for life, depending on the circumstances. If the planet is generally at a nice temperature (like Earth), the extra heat from branding is generally a bad thing. But for a much colder planet then extra heat is usually welcome. How fast do the oscillations occur? How fast can a planet’s orbit change? Well, this depends on the other planets in the same system, the planets that are providing the gravitational kicks. In particular, the mass and location of the biggest bully. Let’s imagine a simple system where our planet is being pushed around by a single other planet. The more massive the planet, the faster the oscillations. And the closer the planet to the star, the faster the oscillations. The time for a full cycle — for the orbit to go from near-circular to eccentric back to near-circular — can take between a few hundred years and hundreds of thousands or even millions of years. Everything I’ve mentioned so far has only really looked at how the shape of the orbit can oscillate. It turns out that the changes in the tilt of a planet’s spin axis — its obliquity — also have a big impact on the climate. A recent study showed that planets with oscillating obliquities may have wider habitable zones. This kind of planet remains protected against freezing over on much colder orbits than a planet with a fixed spin axis. This kind of oscillating Earth may be good for life! Anyplace on an oscillating Earth could be a good habitat. Since it takes a long time for a planet’s orbit to change, the planet has time to adapt. Of course, during an eccentric Earth period it may be good or bad to be close to the “branding spot“. But there is nothing else to favor a given place on the planet. All Earth-like planets are oscillating Earths. Planets don’t form in isolation but in systems with many planets. All planets receive gravitational kicks from nearby planets. Oscillations in the planets’ orbits are inevitable in any system. What can vary from one planet to another is how big the oscillations are. Earth-like planets can be put onto wildly-oscillating orbits by giant planets. Especially when giant planets go unstable and scatter each other. When giants go unstable, the terrestrial planets have about a 50-50 chance or surviving (rather than being thrown into the host star or ejected into interstellar space). The planets that survive tend to be on oscillating orbits. Sometimes very strongly oscillating ones. The frequency of Earth-sized planets in the habitable zone is probably between 5% and 50% (depending on the type of star). All of these planets’ orbits must oscillate simply because of the other planets in the system. Weakly-oscillating Earths are ubiquitous. But only a small number of planets have orbits that oscillate very strongly. About 10% of stars have giant planets. About three quarters of these systems have been unstable in their past. Terrestrial planets should survive about half the time. And a third to a half of the surviving terrestrials should have strongly oscillating orbits. That makes 1-2% of stars with oscillating Earths. Let’s say 1%. There are several hundred stars within 30 light years. There should be some strongly-oscillating Earths very close by, within 10-30 light years. Imagine a system with multiple oscillating Earths! This is actually a natural outcome of the process of planet formation. This image is from a simulation I ran a few years back. Two planets formed in this system: one near the inner edge of the habitable zone and one near the outer edge. The two planets’ gravitational dance makes their orbital shapes oscillate every couple thousand years. The orbits of two planets at two different times. 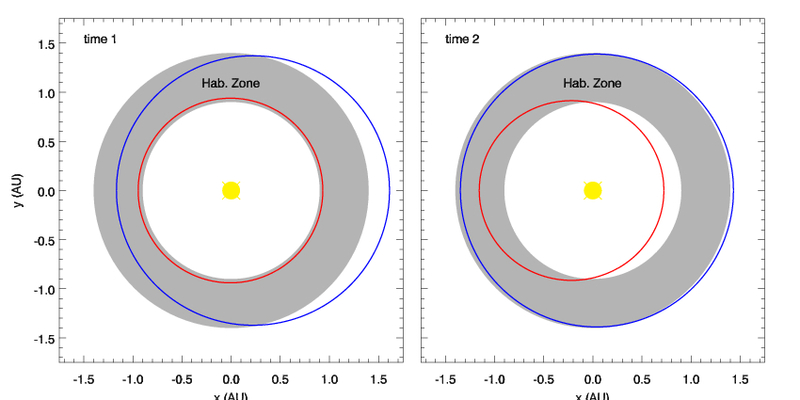 At time 1, the inner (red) planet’s orbit is nearly circular but the outer (blue) one’s is eccentric, taking it beyond the boundary of the habitable zone (shaded in gray). At time 2 — about 10,000 years later — the outer planet’s orbit is circular but the inner one’s is eccentric and takes the planet inward past the inner edge of the habitable zone. From a simulation of planet formation in this paper. They gray shaded area is the habitable zone. When the inner planet’s orbit is circular, the outer planet’s is eccentric and vice-versa. But the two planets want different things. The inner planet is on an orbit similar to Earth. It doesn’t want to get too hot. It’s probably better for life when its orbit is circular. The outer planet is at the cold edge of the habitable zone. It could use a little extra heat. It’s probably better for life when its orbit is eccentric. Both planets are in their preferred configuration for habitability at the same time (during time 1, the left panel in the image)! The system oscillates between having two nice habitable planets at time 1, then one planet that may be too hot and another that may be too cold a few thousand years later. What kind of story could take place in a system like this? Here is one idea. A civilization arises on the cold outer planet. It develops space flight and colonizes the inner planet. The inner planet is only inhabited part of the time, when its orbit is close to circular so the climate is not too hot. The inner planet is used mainly as a giant farm to feed the growing population on the outer planet. There are also some nice warm-weather (beachy) vacation spots on the inner planet. The farmers revolt against the unjust leaders of the outer planet. Unfortunately for them, the revolt takes place when the inner planet’s orbit is changing rapidly. Over a generation the planet plunges into its hottest time (its eccentric Earth phase). Amid an inter-planetary war, the farmers try to bio-engineer a new climate. A perfect place to try out a Daisyworld! The farmers cover the planet with the whitest, leafiest plants they can find. Their goal is to make the planet reflective enough that it absorbs less energy from the star and cools off. But this is dangerous: they have to manage feedbacks (like the ice-albedo feedback) that could turn the planet into a snowball Earth! This is a good one: an inter-planetary war between two oscillating Earths, with attempted climate engineering thrown in! There you have it: the oscillating Earth! Are any sci-fi stories set on oscillating Earths?